No one made chasing down ancient artifacts cooler than Indiana Jones. He would leave the safety of his classroom, which required battling bad guys, to track down artifacts. Fortunately for us, all we have to do is step outside to be in the midst of something much more primitive than anything Dr. Jones collected. Take a walk, and you will easily find yourself in the presence of a species from another age. It surrounds us, but we rarely notice it. Some researchers even think it may have even laid the foundation for terrestrial life. It’s not just one species. It’s two different species intertwined as one, which creates various types of colors and structures. 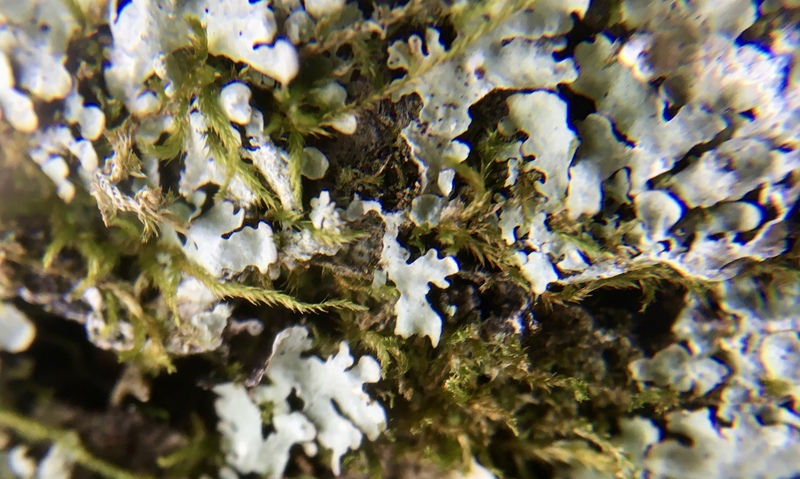 Lichen is actually a symbiotic relationship between two partner species. The mycobiont partner is a fungus that gives structure to the lichen. Fungi are made up of eukaryotic cells, meaning the internal structure is made up of organized compartments and also a membrane-bound nucleus that stores and protects the delicate genetic code. As such, fungi are heterotrophic organisms, obtaining their nutrients externally. In the case of fungi, food comes in the form of fixed carbon, which is often acquired through the process of decomposition. If not through decomposition, the fungus must get the required carbon through a symbiotic relationship with a partner. A photobiont is the second partner into this lichen relationship. Either green algae or cyanobacteria can fulfill the needs of the fungus because they can both photosynthesize. Green algae belongs to the plant kingdom and cyanobacteria is a prokaryotic organism so they are not even grouped together. However, they both have the ability to harness light energy from the sun and use it to make food in the form of glucose, or sugar (carbon source). This works out well for the fungus. The photobiont provides an endless supply of glucose for the fungus, and in return, the fungus provides structure and protection. This partnership seems to have set the stage in primitive times for two important events. This particular study looked at when, specifically, plants and fungi colonized land. Earlier studies had concluded that both came on land about 480 million years ago (mya). Before that, supposedly only rocks and bacteria covered the land. Campbell Biology, a popular academic text, states, “But it was only within the last 500 million years that small plants, fungi, and animals joined them (bacteria) ashore.” Heckman et al. 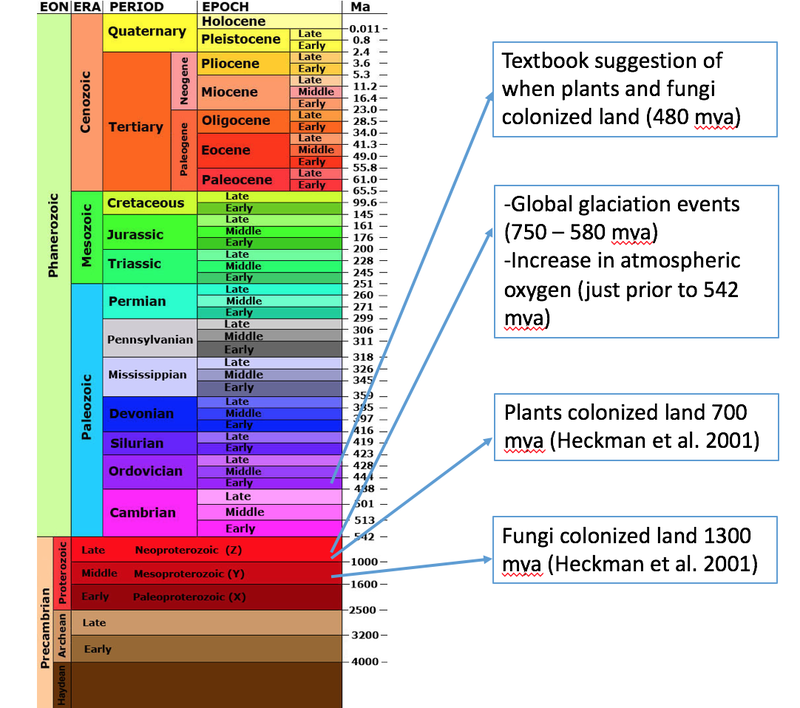 (2001) concluded that for plants actually colonized land 700 mya and fungi around 1300 mya. This is significant because this would mean that these two groups colonized land during the Precambrian, the oldest geological eon. If land fungi and plants did appear during the Precambrian, how exactly could they have played a role in both ice age events and the explosion of various animal forms that we see in the fossil record? To understand this, it is important that one understands just how hard it is to live on land. Compared with living in the water, or at least near water, plants need to have certain vascular tissue like roots, stems, and leaves to transport water and sugars. Some plants benefit from having a thick waxy layer on leaves to keep too much water from escaping. Living on land is tough, and it would have been especially hard 700 mya. This is where lichen come into the picture. The terrestrial plants and fungi were not living separately during this early time. They were living in this lichen relationship. It was this relationship that allowed them to live in these harsh conditions. Lichen can live without rain for months, which explains why it is found in harsh places like the arctic and the hottest deserts. Early in the earth’s history, the green algae needed protection, which is exactly what the fungi provided. Now, photosynthesis could work on a large scale. Carbon dioxide levels in the atmosphere decreased and oxygen levels increased. When carbon dioxide levels decrease, global temperatures decrease. Photosynthesis probably was the main reason why the Earth experienced global glaciation events from 750 mya to 580 mya. This time period lines right up with the appearance of lichen and early land plants like moss (seen mixed in with lichen in above picture). There may have been some other explanations for the decreased carbon dioxide levels. One may have been the mosses and early land plants that are made up of lignin. Lignin is a tough organic compound that does not easily decompose. Carbon gets “locked” up in the lignin and cannot get out. This ends up eventually producing fossil fuels if the plant material gets buried over years and years. Another event that may have helped the decrease of carbon dioxide levels could have been the fact that the first lichen may have produced acids that dissolved the rocks they were living on. This acid released calcium from the rock. When calcium is washed away, calcium carbonate limestone forms, which prevents carbon atoms from forming carbon dioxide in the atmosphere. There was an increase in atmospheric oxygen during the Neoproterozoic era, right before what scientists refer to as the Cambrian explosion. Campbell Biology explains the Cambrian period this way, “Early in the Cambrian period, some 530 million years ago, and immense variety of invertebrate animals inhabited the Earth’s oceans.” In fact, from 535 mya to 525 mya, the oldest fossils of nearly half of all extant animal phyla have been found, including the first arthropods, chordates, echinoderms, and the precursor organisms to vertebrates. The lichen (and the moss) may have been responsible for this oxygen increase that led to this evolution boom of animals. According to a recent study, soil has only been around for the last 450 mya. If this is true, this lichen relationship is truly older than dirt. The next time you are walking in the woods or even in your own backyard, pay close attention to the lichen growing on the trees and rocks. Then, to show respect to your elder, give a slight nod of the head. Heckman, D. S. et al. 2001. Molecular Evidence for the Early Colonization of Land by Fungi and Plants. Science, 293: 1129-1133. Reece, J. B. et al. 2014. Campbell Biology. Boston: Benjamin Cummings/Pearson.